This article is about the game. For the location it takes place in, see Wario's Woods (place). Wario's Woods (Japanese: ワリオの森, Wario no Mori) is a puzzle game released for both the NES and SNES in 1994. It was also one of the many playable NES games in Animal Crossing for the Nintendo GameCube; it could be obtained through using interacting with an islander using the game's Animal Island mode on the Game Boy Advance. The NES version is notable for being the last US NES release given Nintendo's official license (and in turn the last Mario game to be released for the NES), the last NES game developed by Nintendo themselves, and, as a result of its late release, the only officially released NES game with an official rating by the ESRB, being rated K-A for Kids to Adults. The SNES version goes unrated. It is known for being the only game that has Toad as the main starring protagonist, though Captain Toad: Treasure Tracker's main character is Captain Toad, a similar character. Wario's Woods was released to the Wii Virtual Console on November 19, 2006 in America, and December 7-12, 2006 in the PAL regions and Japan. The NES version was later released on the 3DS Virtual Console and Wii U Virtual Console, where it received the E for Everyone rating, and was made available to Nintendo Switch Online members from December 12, 2018. The Peaceful Woods were once a friendly home for sprites and gentle creatures. Since the invasion of Wario and his band of monsters, though, this quiet community has been turned upside-down. Now, it is Wario's Woods and peaceful creatures are not welcome. Toad, the Mushroom Kingdom hero, has made his way to Wario's Woods in order to quiet the sinister lout and win the woods back for the sprites. The sprites can create bombs. It's Toad's job to take the bombs and line them up with the enemies of the woods so that the enemies go down in defeat. If Toad clears enough monster-packed sections of the forest, he'll go up against the mighty Wario himself. The Peaceful Woods was once the friendly home of sprites and other gentle forest creatures. Wario and his band of monsters invaded, though, and spoiled the serenity of the woods. The quiet, woodlands community has now been turned upside-down by these horrifying events. Wario has now named the woods after himself, and peaceful creatures are not welcome. Toad, the Mushroom Kingdom hero, has decided to travel to Wario's Woods and put an end to Wario's evil reign of terror. Toad knows that, with the sprites[sic] help, he will be able to rid the forest of Mario's twisted nemesis. Thankfully, the sprites are able to create bombs. It's Toad's job to line up the bombs with the enemies of the woods, thus defeating those evil creatures. By clearing more and more of the woods, Toad steps ever close to the ultimate challenge of facing Wario. 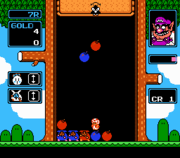 A screenshot from the NES version of Wario's Woods. The SNES version of Wario's Woods. The game plays similarly to Tetris. Toad is the main hero, and Birdo and a Sprite would help Toad by giving him encouragement and bombs to destroy the monsters (respectively). If Toad took too long to complete a level, the rascal Wario would replace Birdo and replace the Sprite with a Pidgit. The Pidgit would then throw more monsters as well as bombs at Toad. Wario would body slam the side of his box to make the Thwomp ceiling descend, destroying enemies would make the ceiling rise up again. Many enemies unique to this game appear. Along with them were several mini-bosses who would attempt to block Toad's path from getting to Wario. 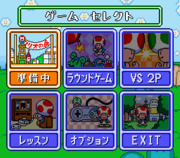 In the end of the game, Wario himself appears to fight against Toad alone. Oddly, Wario appears at a gargantuan size in this battle. Eventually, Toad defeats him, causing him to shrink back to his original size and therefore his powers were also reduced (it was also revealed that Wario had in fact used an airpump to inflate himself to a much bigger size in order to battle Toad). Toad then proceeds onwards by chasing the antagonist out of the Woods. However, in the SNES version, Toad does not chase Wario out of the Woods but instead bombs his castle; thus, announcing the defeat of the antagonist. Once Wario is defeated, all the creatures who were under the nightmare that Wario had cast upon them had awakened, allowing the woods to finally be restored back to peace. The SNES menu of Wario's Woods. The NES version has five game modes: Round Game, Time Race, VS, Lesson, and Option. Round Game is the basic game with 100 levels (this is much like the story mode of the game, featuring the bosses and events within the game). The levels increase in difficulty as the player progresses, starting with more monsters and more kinds of monsters. It also has an A and B game mode. Time Race has three levels of difficulty and has players racing against the clock. 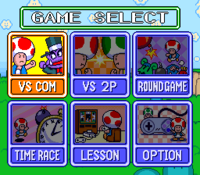 VS is the two player mode (the second player has the option of choosing a green Toad as their character). Lesson teaches the game basics. The Option menu gives the options such as name change (of the player), data clear, and rankings. The SNES version has six game modes: VS COM, VS 2P, Round Game, Time Race, Lesson, and Option. Most are the same as their NES counterparts, but more robust. Round Game added an overworld map with different locations like underground caverns and a castle, and VS 2P is essentially the same as the NES VS. The exclusive VS COM allows the player to play against an AI player in three modes of difficulty, and added colorful characters to play against like Katsini. Bosses were removed from Round Game and are instead made the focus of VS COM, with the bosses varying from each level in the game (ie. aquatic creatures are the bosses of the underwater levels, while the more powerful ones are located in the castle). Like in the NES version, they attempt to decline Toad's attempt of saving the sprites' forest. Upon defeating all the bosses within VS COM, Toad meets Wario himself in person and the two would then duel in an intense fight that would determine the fate of the woods. 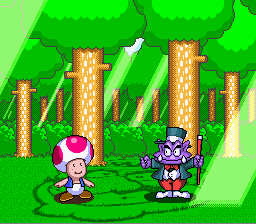 Toad encountering a regular sized Wario in a cutscene of the NES version. Toad encountering a more powerful and larger Wario in a later cutscene. In the Round Mode of Wario's Woods, the game takes on a story mode sequence with cutscenes being frequently encountered throughout the game. These cutscenes often take place after every 10 rounds, and they are scenes of Wario taunting Toad as the hero gets closer to defeating Wario. In most of these cutscenes, Wario often calls Toad insulting names such as "'Shroom" in order to discourage the royal mushroom retainer from keeping up with his victory. Wario also appears to grow in size throughout the game; thus, showing his powers increasing. In the final round levels, Wario can be seen to be in a gargantuan size (though it is revealed that he was just inflating himself with an air pump). In the end, Toad can finally be seen chasing Wario out of the woods. In the SNES version of Wario's Woods, cutscenes return; however, they are not only consisting of the interactions between Toad and Wario, but as well as the interactions of Toad and all of the mini-bosses that he encounters throughout his adventure. Their interactions are all based on their respective personalities, and would often taunt Toad before beginning their battles. Additionally, they would also make fun of and insult Toad if he were to lose against them (often causing Toad's emotions to change as depicted by his appearance in each of the cutscenes). Toad facing off against Katsini, one of the mini-bosses from the SNES version. 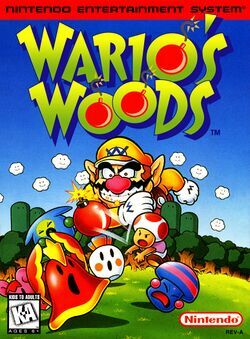 Title screen of Wario's Woods Burst of Laughter Version. Menu screen of Wario's Woods Burst of Laughter Version. 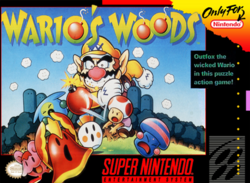 Unlike International releases, Wario's Woods was never released as a Super Famicom cartridge. However, two variations were exclusively released for the Satellaview add-on. The first version was called ワリオの森 爆笑バージョン (Wario's Woods Burst of Laughter Version). In this one, many of the character graphics were replaced with caricatures of Japanese celebrities. 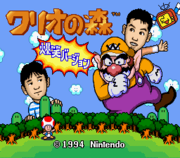 The second version was called ワリオの森 再び (Wario's Woods Again). This version lacks the edited graphics, making it more similar to the English release. However, there are also other removals, such as the round-game-style Single Player mode and Story Mode Dialog. Catherine was also replaced by the female avatar from the Satellaview hub, BS-X それは名前を盗まれた街の物語 (BS-X : The Story of The Town Whose Name Was Stolen). Wario's Woods was co-developed by Nintendo and Intelligent Systems. Nintendo's Kenji Miki was the producer and director, while programming was handled by Intelligent Systems' Hiroyuki Yukami, Hironobu Suzuki, and Makoto Katayama. The game employed two different sets of graphic designers and musicians (one for each system), despite a few sprites and compositions having noticeable similarities between their 8- and 16-bit versions. Soichiro Tomita, Masahiro Iimura, and Naotaka Ohnishi designed the graphics for the NES version. Ohnishi also designed the SNES version's graphics, joined by newcomer Ryota Kawade, who later in his career became a director for the Paper Mario series. The NES version's music was written by Shinobu Amayake and Soyo Oka, while that of the SNES version was written by Hiroaki Suga and Tadashi Ikegami. For this subject's image gallery, see Gallery:Wario's Woods. Super Mario Bros. 2: Toad carries and throws his opponents in a similar way to this game. Additionally, his superhuman strength also originated from this game. Enemies such as the Spud resemble various items from this game. 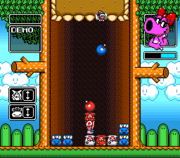 Wario's Woods also marks Birdo's Mario franchise reappearance since this game. Mario & Wario: The Sprites of the Peaceful Woods may be a reference to the exotic fairy Wanda of Yōsei no Mori. Super Mario 64 DS: The Toads in this game are afraid of Wario, which may be a reference to this game's events. Mario Superstar Baseball: Both Toad and Wario share bad chemistry with each other in the game, which might be a reference to the events of Wario's Woods. Oddly, the two share neutral chemistry in the sequel. WarioWare: Smooth Moves: The microgame Super Nostalgic Entertainment System involves the player placing a cartridge of Wario's Woods correctly into a SNES or Famicom (the latter for Japanese releases). In his NES sprites, Wario's cap and shirt are pink and white respectively instead of the correct yellow, and his pants are pink rather than the correct purple. This is due to the console's palette and color limitations. This is the only appearance of Wario in an NES game. The SNES instruction booklet uses Birdo's Japanese name, Catherine. A mode noticeably inspired by Wario's Woods called "Blob Blast", featuring familiar bombs and stylus controls, appears in Brain Age: Concentration Training. This is a similar homage to the Dr. Mario-influenced Virus Buster mode appearing in previous Brain Age games. ↑ Nintendo. (December 4, 2018). ファミリーコンピュータ Nintendo Switch Online 追加タイトル [2018年12月]. YouTube. Retrieved December 14, 2018. ↑ Nintendo. (December 4, 2018). Nintendo Entertainment System - December Game Updates - Nintendo Switch Online. YouTube. Retrieved December 14, 2018. ↑ Info on Wario's Woods Burst of Laughter Version from SFC MANIA blog. ↑ "Catherine and the Sprite assist Toad by tossing bombs into the playing field." - Wario's Woods SNES instruction booklet, page 3. This page was last edited on April 6, 2019, at 14:07.